On the 24th and 25th of April Go St Andrews held its launch event and tour of St Andrews University’s campus. 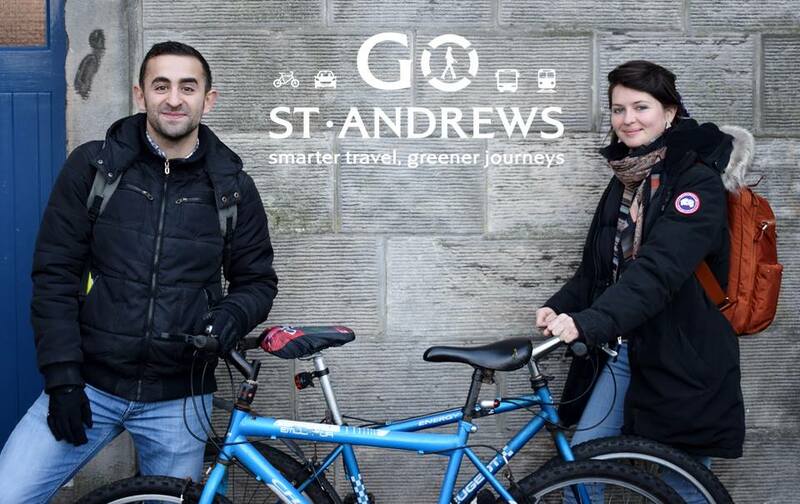 Go St Andrews is a new hub for sustainable transport information in and around St Andrews. This initiative is a collaboration between Fife Council, Transport Scotland, Transition University of St Andrews, BID St Andrews, and partners. The website aims to deliver clear and concise information on all the sustainable transport options in and around St Andrews, aiming to build up a community of people who choose to take modes of transport that will decrease their carbon footprint. On the 24th April representatives from Sustrans, Cycle Solutions, Cycling UK Scotland, Chariots of Hire, Cyclepath, E-Car, Liftshare, St Andrews Park Run, Transition University of St Andrews, St Andrews Space for Cycling and Cycle Fife came to Market Street to increase awareness of the different resources available to them across the town and gown. Due to high winds we had to shut up earlier than expected, however we were pleased by the encouraging amount of people who came to ask questions and give us suggestions of what they would like to see happen in St Andrews. 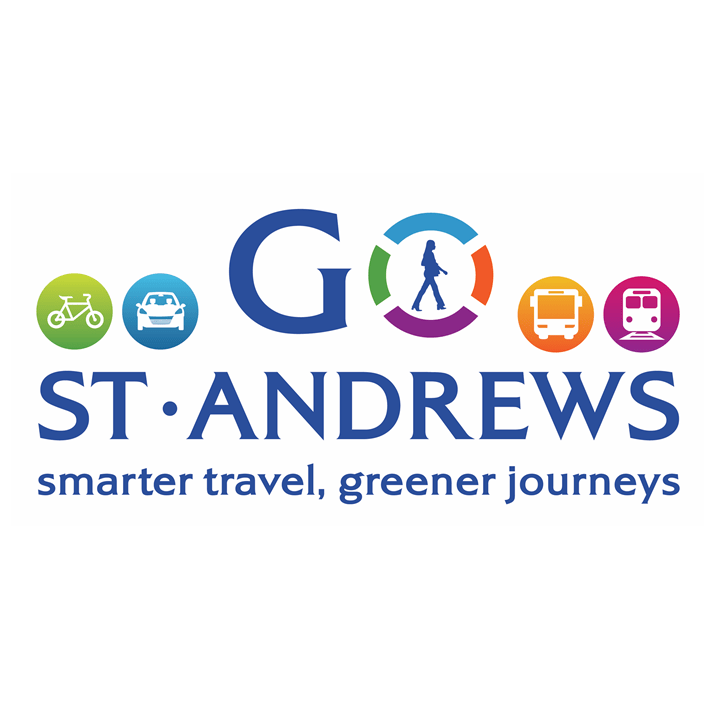 As a result of the launch of Go St Andrews we hope to see an increase in the number of people who are interested in taking different forms of transport to reduce their impact on the environment and those who are aware of the huge variety of options available to them in and around St Andrews. The website covers areas including walking, running, cycling, carshare, E – Car, buses, trains and fun ideas for local day trips. If you see something missing or would like a new tab opened please get in touch with your ideas. A huge congratulations to the team at Transition St Andrews University and everyone else involved who have been working hard over the past couple of months to launch this fantastic new website. Go check it out now at http://www.gostandrews.org/. If you have any questions about transport in and around St Andrews please do not hesitate to contact us. Go Active, Go Explore; Go St Andrews. Recently we conducted a Student Travel Survey asking our students questions about their travelling habits during term around our campus, and how they get to and from university. This annual survey seeks to understand year by year the changing travelling habits and attitudes of our students, and to identify patterns in behaviour. The survey enables vital insights to be made in order to influence how we plan and prepare our facilities for students, and how we can meet the needs of those travelling around St Andrews. The survey also aims to highlight knowledge gaps, to establish how we can better promote and offer more sustainable transport options to our students and to establish target areas to effectively reduce our university’s carbon footprint. According to the survey 12.5% of the students who responded own a car at university and primarily view it as essential to getting home or for convenience for getting around the university including doing their weekly shop or for leisure at the weekends. From the survey it has been found that most of these students would not bring their car to university if improvements were made to local transport networks, including cheaper bus fared between Leuchars and St Andrews, and if a train station was installed in St Andrews. From the survey it is also apparent, that travel by bus is not a popular form of transport for students, however discounted tickets for students, particularly between St Andrews, Leuchars and Dundee, could encourage the majority to use these services more often. Cycling is a hugely popular form of transport within St Andrews, especially with students. It is therefore important we gather annual information based on cycling in St Andrews so that we prepare and provide the correct infrastructure and services to support students and to encourage them to continue to cycle. From the survey it is apparent that most students would be encouraged to cycle if paths within St Andrews were improved, and their number increased. In addition, it has been identified that there is a clear need for an increased number of covered cycle racks at residences. With these results in mind, we look towards the rest of 2017 as a year of progress and innovation as we strive for sustainability. Thank you to everyone who took part and for their time and insight. For more important information on travel options in St Andrews please go to www.gostandrews.org a new hub for sustainable transport in St Andrews. If you have any comments on sustainable transport within the University please do get in contact with us by emailing environment@st-andrews.ac.uk. We would love to hear from you. It has certainly been a very busy year for the University of St Andrews’ Environment Team. The team have been consistently hard at work throughout the year with the University seeing an overall carbon emissions reduction by 8% compared to 2014/15, water consumption reduction by 4% and with reuse by from 2% to 4%! Throughout the year, Amanda our BEMS Engineer, has been working towards the successful completion of BEMS rationalisation and Siemens graphics which are now online for 50 of our buildings. We have also seen a change of Sustainability Officer when George King finished his post in the summer and Lindsey Mackay taking the position on at the start of August. The team strives for sustainability across the whole of the University and we would like to thank all the departments and people who have worked alongside us this year to make it a success. We look forward to entering 2017 to tackle new challenges and continue to work hard to ensure that the future of the University, and its surrounded environments, are protected. To help mitigate against travel disruption and to encourage the use of sustainable travel to and from work, the Environment Team and Transition operated a successful park and pedal scheme during road closures. As part of the on-going work around The Open and sustainability the R&A will work on a number of local legacy projects from the 2015 Championship in St Andrews. Three projects have been agreed for funding to be delivered by Keep Scotland Beautiful, the University of St Andrews and Fife Coast and Countryside Trust. The R&A would like to meet with various stakeholders to discuss opportunities around biodiversity related projects and have formed a discussion group to explore potential opportunities for collaboration and resource sharing in this area. Work with the University includes a Green Links map and noticeboards to advertise biodiversity hotspots around St Andrews. This year we saw the introduction of the Green Society’s Award in collaboration with the Students’ Association which seeks to engage societies with sustainability and environmentally friendly behaviours. This year’s winners were St Andrews Adventure Group for their commitment to using electric cars throughout the year. The annual Green Sports Award went to the Canoe Club, winning £100. Continued work on University documents for Adaptation to Climate Change in order to ensure we are prepared for the impacts of climate change and to improve the resilience of the whole University as part of the Adaptation Learning Exchange (ALE). Adaptation Scotland are using the University of St Andrews as a case study for the rest of the sector, with staff and senior managers of Estates undertaking a climate impact assessment workshop. You can read the final document here. Every year, when the students arrive back after the summer holidays, the centre of St Andrews gets busier and so does work within the University. This year Transition put on a huge array of exciting events including StAndRe-Use. The Environment Team were present to help out at various events and we had our own information stalls at the Green Fayre and Freshers’ Fayre, aiming to engage with students and let them know about our crucial work on campus. A full, fun filled but exhausting week! Within every hall on the University of St Andrews’ campus there are committees made up of students and wardens. Environmental Hall Reps make up a crucial part of each hall committee and whose role includes helping to reduce energy bills and costs throughout the year whilst promoting environmentally sustainable behaviours to their student bodies. 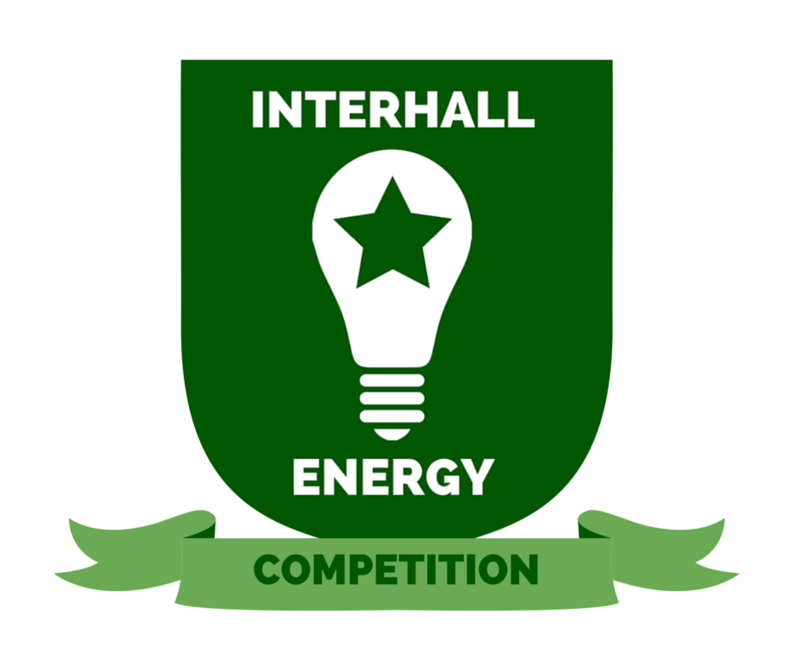 At the end of September we held our annual training which was a great success and since then we have begun the Interhall Energy Competition and seen activities in halls including, Light Switch Off parties, environmentally friendly selfie competitions and Fairtrade quizzes. We now have our first Sustainability Manager! As of October, David Stutchfield, formally our Energy Officer, has now been promoted to Sustainability Manager within Estates. His roles will remain the same as before, but with a few extra important jobs added on. 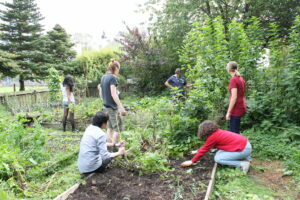 Every two years the University requires its University Fairtrade Status to be renewed which involves collecting information on Fairtrade activities and outreach on campus, and looking at products sold across campus. We are delighted to announce that after a successful application, we have renewed our Fairtrade status for another two years with many more Fairtrade events coming your way in Fairtrade Fortnight 2017! Watch this space! Raisin Weekend is a well-known tradition associated with St Andrews University, where academic families host an array of events and parties for their ‘children’, ending in a spectacular foam fight. The Green Raisin Competition encourages families to dress up their children in environmentally friendly costumes, with the idea that they reuse items instead of buying new things! This year we saw a fantastic array of costumes enter the foam fight with our winners being a Viking ship. The winning family receive an adventure kindly given by Blown Away Adventures! We held our first training of the academic year for the Environmental Facilitator programme for being interested in working within their departments and units to promote, champion and support environmentally friendly behaviours amongst their teams and making their colleagues aware of the impact they have. With help from CAPOD, we hosted a networking event with representatives from E-Car and Electric Bike Scotland coming to speak to us over lunch. Later in the afternoon we had a demonstration of the electric bikes with the chance to try one out for ourselves! The amount of landfill has increased from 641 tonnes to 750 tonnes with % recycling down from 73% to 68% (academic year 2015/16) however reuse has increased from 2% to 4% (14 to 32 tonnes) which is significant and highlights the University’s efforts to move waste management up the waste hierarchy. In the past academic year we have also collected and baled an additional 20 tonnes of cardboard for recycling. Over 1500 items of bedding (duvets and pillows) were collected to be deconstructed and reused as fill for new mattresses. This is a fantastic example of circular economy which the University and the Environment Team are aiming to implement and encompass within its various processes, in order to reduce waste and increase resource productivity. Resource efficiency was implemented through a number of positive initiatives including supplier takeback schemes and WARPit – a resources redistribution scheme for staff. To date this has saved 107 tonnes of carbon by diverting waste from landfill and saved £187k on reduced procurement spend. End of Term donation points were also set up in Halls of Residence and collections carried out for student society StAndRe-Use, Barnados Books, Glenrothes Food Bank and local charity Forces Support. 17 tonnes of material was donated to Forces Support including clothing, shoes and crockery. December was a very exciting month for the Environment Team and the University of St Andrews. The Eden Campus biomass district heating centre was awarded the Sustainable Development Award at the Scottish Green Energy Awards! Furthermore, a week later the biomass district heating boiler was officially lit by our Principal and commissioned! Sustrans, the UK’s leading smarter travel charity, are challenging people across Scotland to commute by low-carbon means, during May 2016. Here in St Andrews we are already blazing a trail; the University is in 5th place. We can make that 1st place with your help. You can compete with colleagues, other organisations across Scotland and yourself. There is an online leader board so you can compare key stats and track your progress and your colleagues’. By taking part in the challenge (a minimum of 1 journey per week) you could be in for a chance to win prizes. Plus walking, cycling and lift sharing are all guaranteed to save you pennies. Want to reduce the risk of your bike from being stolen? Looking for a lock to protect it? Want to be more visible as the nights draw in? Then come along to one of our ‘get secure’ sessions! Not only are we selling bike locks at a subsidised price of £10 (RRP £15) but we are also giving away reflective and flashing armbands for *free*. That’s right – free! On top of that Police Scotland will be offering security markings for your bicycles and electronic equipment – again – at no cost. If you are still looking to purchase a bike then you can join the Bike Pool on Facebook or contact BikeWorks on Facebook or by phone on 01592 751500 who provide second hand refurbished bicycles. With summer well on it’s way, and better weather (hopefully!) just round the corner, it’s the perfect chance to step away from the car keys in favour of walking or cycling. This not only reduces your carbon emissions, but getting active also has great mental and physical health benefits. It can be a challenge to break the habit at first, so here are some tips to help get you moving…. Going it alone can be a bit daunting, so why not use a walk or cycle as an opportunity to meet up with friends? Instead of sitting in a cafe, get your drinks “to-go” and head for a walk around the park to catch up. It’s much better for you, and besides, who wants to sit indoors when the sun is shining? If your destination is too far to walk or cycle, taking the bus and getting off a few stops early is a great first step. The idea of tackling long distances might be off-putting, but using public transport for part of your journey is much easier to manage – you can always increase your distance later on! Get moving and get away from your desk to help de-stress, rest your eyes from the glare of the screen, and energise yourself for the rest of the afternoon. Sitting for long periods of time isn’t good for your health, so why not invite your colleagues on a lunchtime stroll to walk off your lunch and do a bit of team bonding? If it’s hard to motivate yourself to get walking or cycling without a purpose to your journey, take along your camera and turn it into a photography project. InstaMeets take place all over the world, encouraging people to get together to explore their environment creatively. Participating in a Weekend Hashtag Project is a great way to challenge yourself, get inspired, and update your Instagram feed in the process. If you have a pedometer, activity band, or even just an app on your phone, you can keep track of the steps you’ve taken, calories you’ve burned, and some even record your heart rate. Monitoring your progress like this can give you the boost you need to keep going on a streak of activity, and should help you recognise your achievements, motivating you to keep active in your day-to-day life! 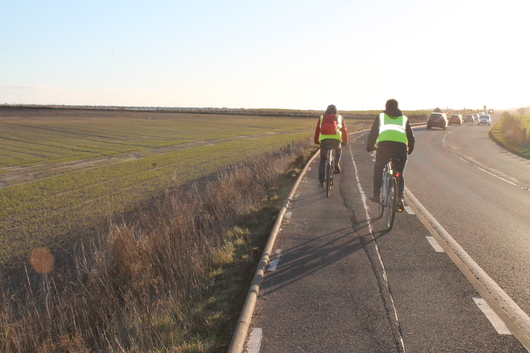 A walk or cycle can make for a fun day out, and there are plenty of organised events that you can get involved in, especially with Bike Week taking place from 13th-21st June. Check out Bike Events Scotland for more information about events in your area. If you need some motivation, sign yourself up for a sponsored walk or charity cycle to give yourself a goal to work towards. The money you raise will be great incentive to keep going, and will be helping out a worthy cause. Pedal for Scotland have a variety of rides organised for September – so you’ll have plenty of time to get training! Bike sales, repairs, and security marking – oh my! Thanks to all those who came along on Friday to our annual Freshers’ Bike Sale hosted by the Environment Team and Bikeworks Fife. Hopefully everyone was able to go away from the sale with something – if not a new bike, then some safety advice, free reflective armbands, or a new set of lights or lock. Bikeworks: Call to arrange a visit to purchase a bike directly from their workshop in Glenrothes. A very friendly team who will build the bike to your specifications, pick you up from Glenrothes bus station, and will deliver your bike to St Andrews once built. Skillshare Dundee: Call to ask for availability and/or bike maintenance sessions in Dundee. The Bike Station: Call to check next date of bike sales at their workshop in Edinburgh. Please note that while the above 3 options are not located in St Andrews, it is possible to transport a bike back to St Andrews on the train. As always, there are also new bikes available for purchase at Spokes on South Street. And finally, a great place to look for one-off sales is through the St Andrews Flea Market Facebook page and website. If it’s bike repairs you’re after, then look no further than our very own Bike Pool. They will be offering training classes on 27th and 28th September, and will be carrying out their first maintenance sessions at DRA on 25th October and 29th November. Please email ke68@st-andrews.ac.uk for more information.